Major Stemmer had her Kampfgruppe in position. Her mission was simple -REVENGE! 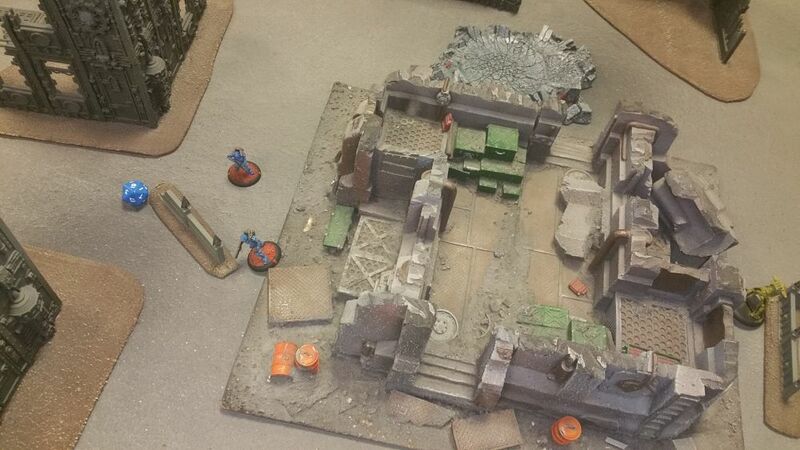 The Rangers had just reported sighting the Capitol Warlord Uncle Sam in the ruined city blocks ahead. "Kameraden! To the death! Honor demands it!" Building and Ruins counted as Heavy Cover, and the low walls and craters as Light Cover. The cool building in the middle was considered to be the convergence. Capitol has the initiative! Opening turn Capitol plays Fortunes of War! Both Warlords end up suffering 2 wounds! The Sea Lions on the far side of the board activate first! They open fire on the Rangers and inflict minimal damage. Bauhaus strikes from the skies! The Vulkan live by the motto of "Who Dares, Wins!" 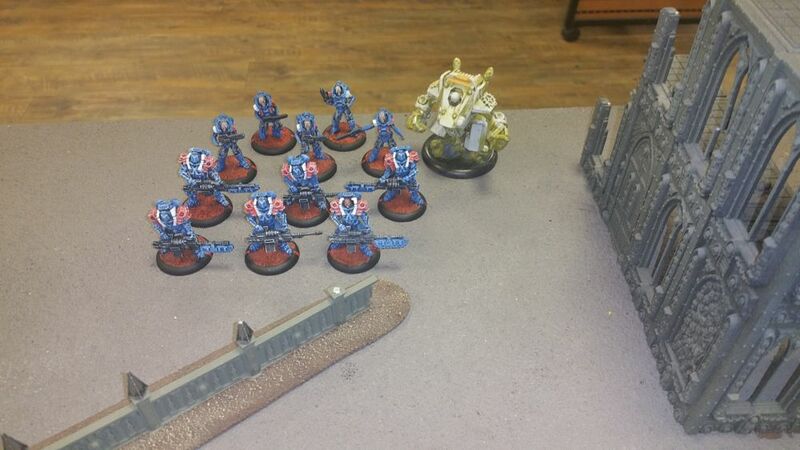 and lands just behind Uncle Sam and the Heavy Infantry. He knows that to beat Capitol he has to hit them where it hurts, the bank! The Vulkan Engages Uncle Sam and his cohorts! Striking with Critical Force his Pressurized Punches eliminating both Uncle Sam and the Iron Lady! Pride for Bauhaus! Audio records show that Uncles Sams last words before falling in battle were "Better dead than Red!" 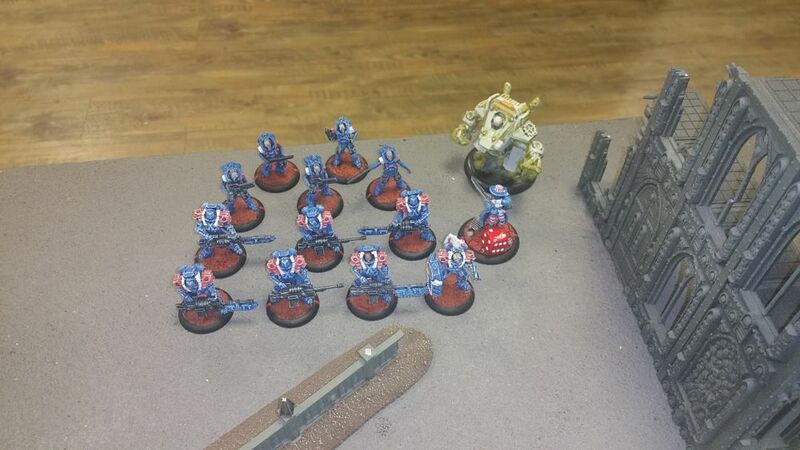 The Heavy Infantry cry out for vengence and close with the Vulkan! A Few remain on sentry, they know what comes next! The Etoiles Mortant in typical fashion execute their suicide mission. They land just behind the Vulcan and with fire and sword they strike! A terrible melee erupts and elsewhere on the battle field the troops begin to seize ground. The Orca lumbers forward searching for targets to liberate. Brave Hussars hold the line as the Ocra approaches, they ready for the fight of their lives! Free Marines engage the Rangers but the Rangers hold fast, they must protect the Comm Relay! Below them Hussars ready the ARG to engage the Orca, with a skilled shot, they do serious damage to the weapons, but not before in inflicts terrible loses! 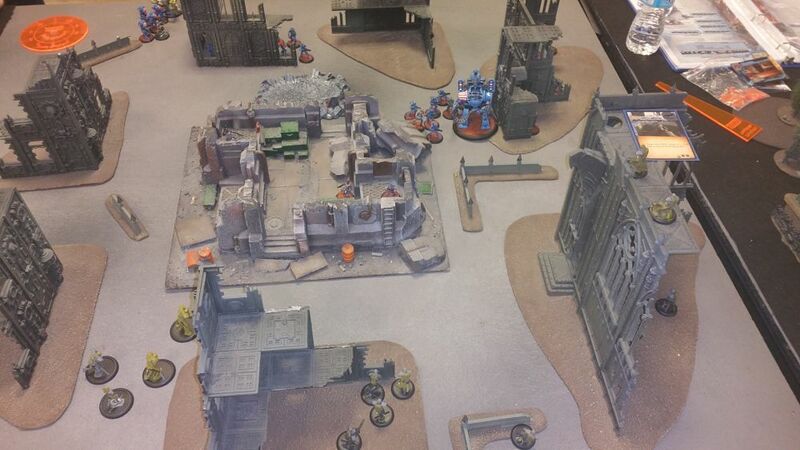 Both ARGs are lost to skilled shots of Capitol sharpshooters. The Juggernaughts and Major Stemmer advance on the Convergence! 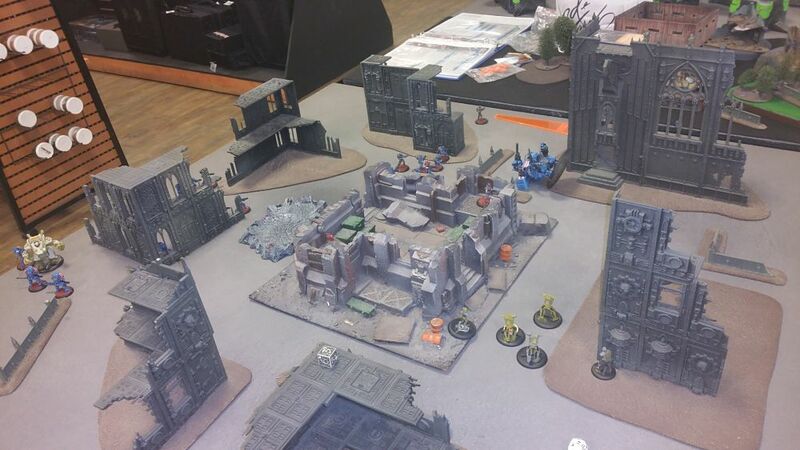 As a new turn begins Bauhaus Activates a Seismic Disruption just in front of the Orca and the Light Infantry! For the moment their advance is halted. The Orca Lumbers forward and straight into the sights of the Juggernauts! Knowing the machine is damaged they rush forward to bring it down. With the supporting fire of a Hussar and an MG40, they destroy its weapons and it's hull! 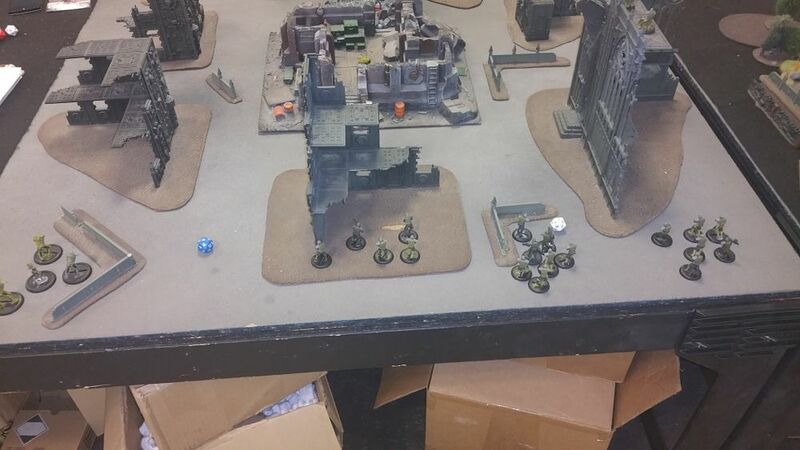 The Etoliles are destroyed and a squad of light infantry have secured their secondary objective! The Juggernaut is locked in deadly combat with 2 heavies and a lone Banshee! As turn 4 begins Bauhaus intelligence continues its attack on Capitol with Spiraling Costs! 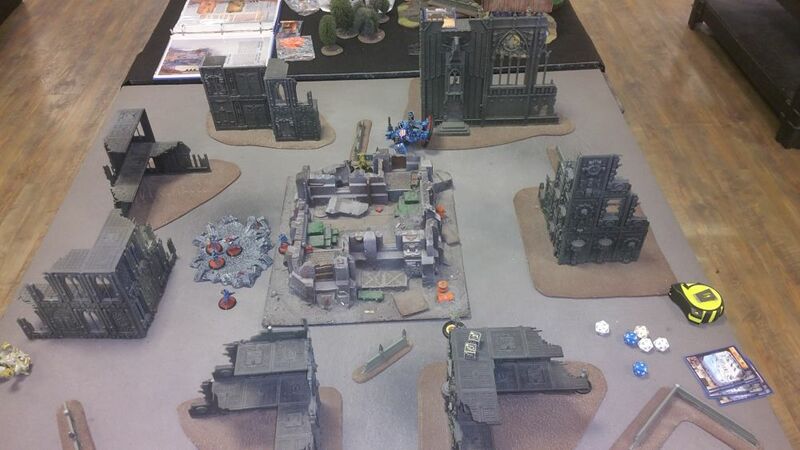 The Vulkan fights for it's life and the Juggernauts move in to finish off the Free Marines! 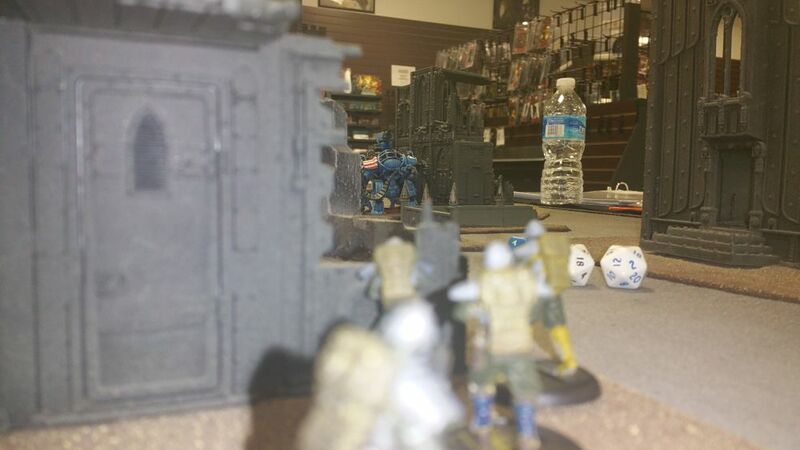 A lone Heavy breaks off his assualt and targets Major Stemmer, she is knocked out! Hussars sell their lives at great cost to the enemy. The Vulkan is destroyed! The last remaining Sea Lion fights with great honor and ties up a Juggernaut! The Juggernaut squad leader steps out of the rubble. He's not that fast. They shoot him to pieces. Lone Hussars sell their lives deeply to prevent Capitols Advance. 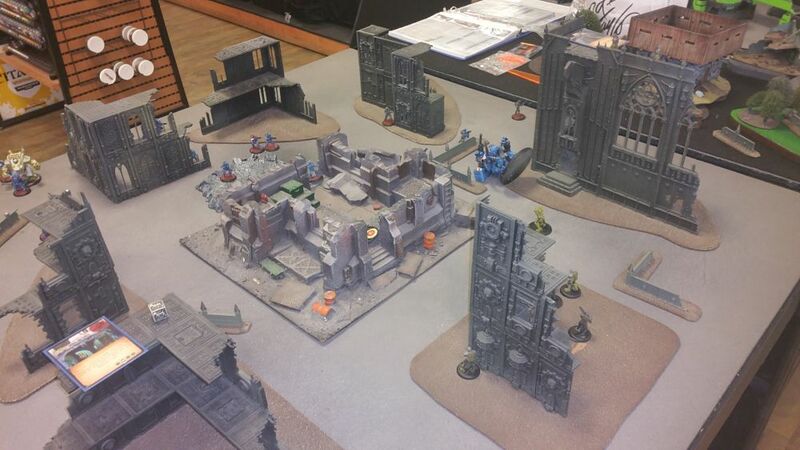 But in the end only a few Light Infantry, a Juggernaut, and 2 Rangers remain. At great cost, both forces fail their primary mission. But Bauhaus can count this as a minor victory having had complete its Secondary and Corporate agenda missions. This was a really exciting and fast paced battle. I was so involved in it that I took pretty poor notes of the battle and missed a good deal of picture opps. The Warlords played very minimal parts in this battle thanks to the opening strategy card, which if you not familiar with it, it forces you to discard cards that then become autohits on your warlord. My Vulkan and Juggernauts, in my opinion were my most valuable units this game. The Rangers didn't do much but were able to hold the Comm Relay. I also believe that if it hadn't been for my successful rapid deployments and subsequent combats the game would have gone very differently had the Banshees been able to get away. 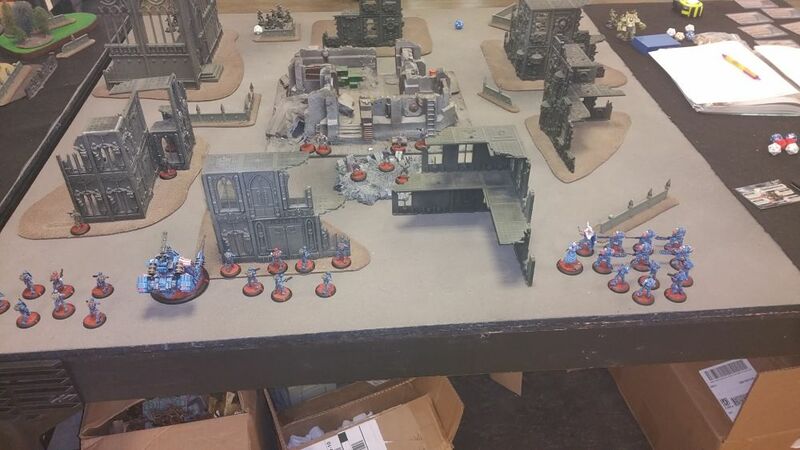 Big thanks to duck_bird for a great game and putting up with my still poor knowledge of the rules. I think this is my 5th game and I'm very pleased with it. There are a few things that need some tweaking but it's always a blast to play. This was a fun one! Very close and brutal game. 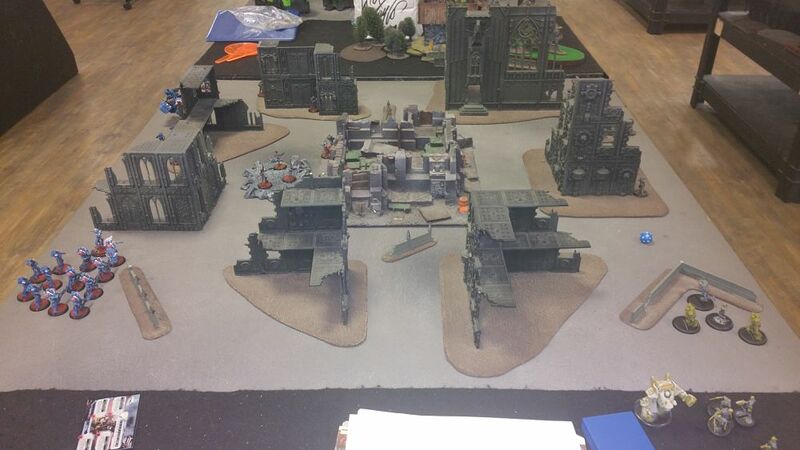 My secondary mission was for Uncle Sam to kill at least 2 enemy models or end the game engaged. Sadly, he fell to his nemesis, Vulkan Von PunchyFist, on the first turn! My corporate mission was to steal back a corporate macguffin that the filthy bauhaus commies had stolen. That was the only objective I completed. My deck was pretty simple. I don't have exact numbers but it's mainly Fog Bomb, Capitolian smoke screen, Gung Ho, Forget it, Peppershot settings, Freedom in Death, Iron Union, Seeded Sand, Fortune of War, and Engines overheat. I didn't get to use too many of 'em though! 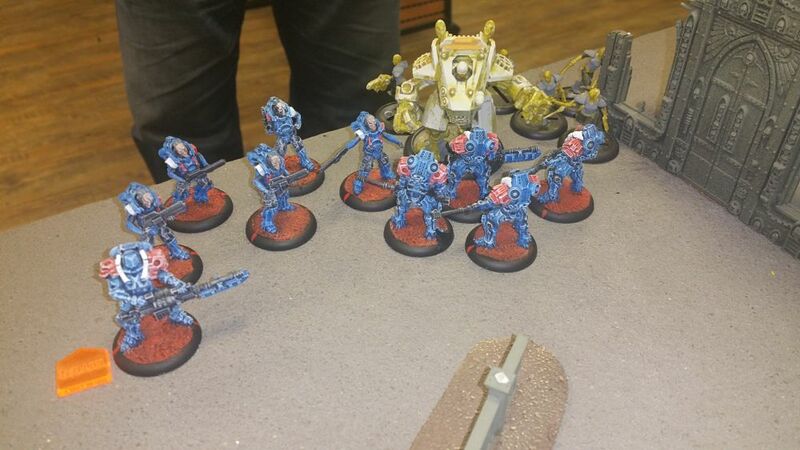 My deployment was a bit goofed and Dullahan definitely punished me for it with the rapid deploying. I lost poor Sam, the Iron Lady, and 4 banshees before they could do anything. The rest of the match was very fun. 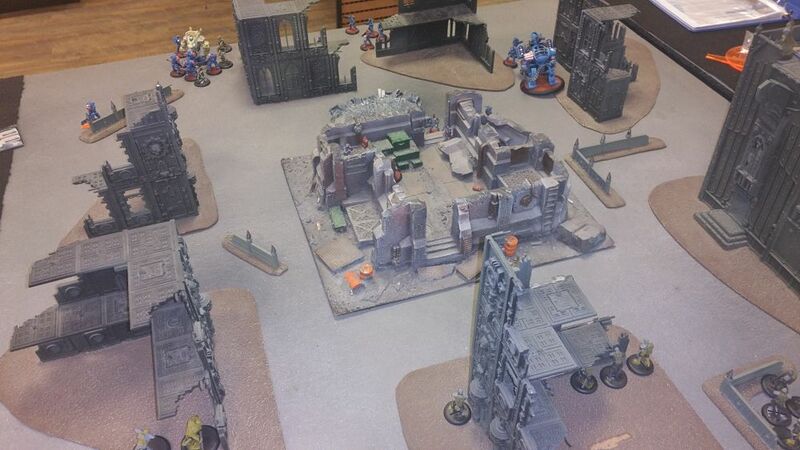 The battle over the big building in the middle with free marines and juggernauts was awesome. I loved the building you had at the convergence... really lends narrative weight to the exercise!